In this Carbogrip tech video Effetto Mariposa showcases some ways to use Carbocut and some tips for home mechanics. 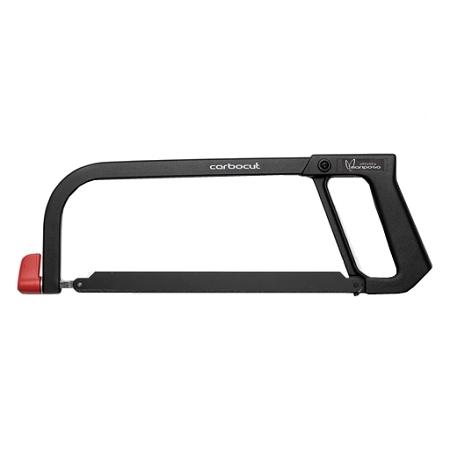 Effetto Mariposa® CarboCut™is a revolutionary hacksaw specifically designed for the bicycle world – it's the best possible tool you can have for cutting hard materials (ceramics, steel, titanium...) and it positively shines when it comes to working with composite tubes and parts. Thanks to its grit edge tungsten carbide (WC) blade (metallurgically bonded tungsten carbide grit on a toothless metal blade), Carbocut won't damage carbon or Kevlar fibers, but smoothly cut through them. cuts faster, with a better finish & no fiber damage. Gritted blades have thousands of cutting edges and cut with a 'grinding' action rather than the aggressive 'ripping' action of toothed blades, reducing the risk of debonding fibers from the matrix. The edge of a carbon tube cut with Carbocut is smooth and without sharp or uneven edges, saving the sand-paper time. the Carbocut blade cuts both on push and pull stroke, providing more control and less vibrations. Being 19mm (3/4") tall, the blade itself is an additional guide for straight cuts. 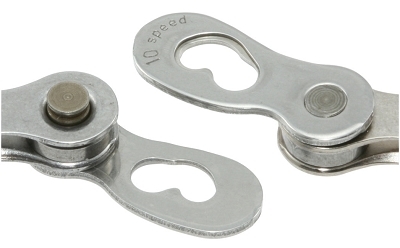 Spacers or washers might be needed to use the WC blade with some cut jigs, due to the slightly wider cut-width (1,6mm instead of 0,9 of a standard blade). WC blades greatly outlive standard metal toothed blades, especially when cutting difficult materials (like composites). composites, hard metals (hardened steel, cast iron, titanium) ceramic, and masonry. Softer materials like wood, plastics or aluminum are more easily cut with standard toothed blades. 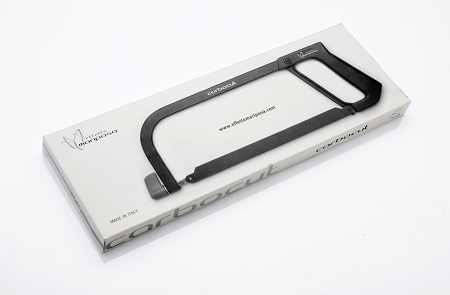 Carbocut accepts 10" blades, making it very compact and easy to carry in a toolbox or to use in tight spaces. Replacement 10" WC blades are available from Effetto Mariposa distributors. the Carbocut handle is made with certified aluminum (EN AB46100 alloy, no scrap-aluminum added), its frame with certified steel (Fe42) and its blade is simply extraordinary: this tool is built to last and perform. 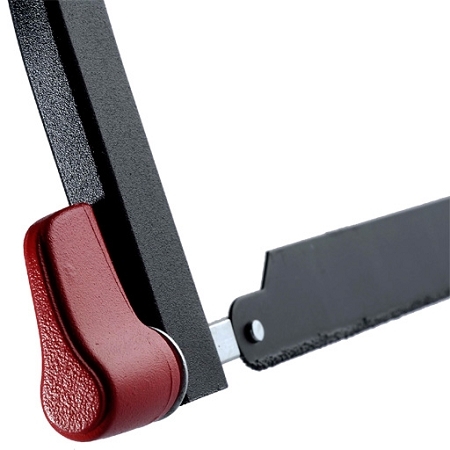 An ergonomic blade-tightening knob ensures the correct blade tension for many, perfect cuts. Tungsten Carbide (WC) is a chemical compound containing tungsten and carbon. Like most ceramic materials (especially carbides) it has very high hardness, high thermal/chemical resistance but, compared to metals, it's very brittle. Measuring its hardness on the Mohs scale (see **1, About the Hardness), WC rates 9 just below diamond (which rates 10 on the same scale, while titanium and steel rate respectively 6 and 6.5), making it a suitable material for cutting tools. To reduce its brittleness WC is cemented: WC powder is "sintered" (see **2, About the Hardness) with Cobalt (a ductile metal) powder. The result is a metal-matrix composite, where cobalt (that enters the liquid stage during the process, unlike WC) embeds/cements WC grains. This composite has an higher shock resistance/toughtness than WC alone, preserving most of its high hardness. Friedrich Mohs (January 29, 1773 - September 29, 1839) was a German geologist/mineralogist. In 1812, using relatively common minerals, he created a hardness scale that is still used today, called the Mohs' scale of mineral hardness. The hardness of a material is measured against the scale by finding the hardest material that the given material can scratch, and/or the softest material that can scratch the given material. The Mohs scale is a purely ordinal scale. For example, corundum (9) is twice as hard as topaz (8), but diamond (10) is almost four times as hard as corundum. Table 1.1 shows comparison with absolute hardness. On the Mohs scale, a pencil lead has a hardness of 1; a fingernail has hardness 2.5; a copper penny, about 3.5; a knife blade, 5.5; window glass, 5.5; steel file, 6.5. Using these ordinary materials of known hardness can be a simple way to approximate the position of a mineral on the scale. Table 1.2 incorporates additional substances that may fall between levels. Sintering is a process that takes place at both high pressure and high temperature and is ment to create solid parts starting from powders (usually ceramic, but a mix of ceramic and metals or metals alone can be used as well). Solid state sintering is when the heating temperature is below the melting point of the powders, liquid state sintering when at least one (but not all) element melts during the process. Cemented WC is obtained from liquid state sintering. 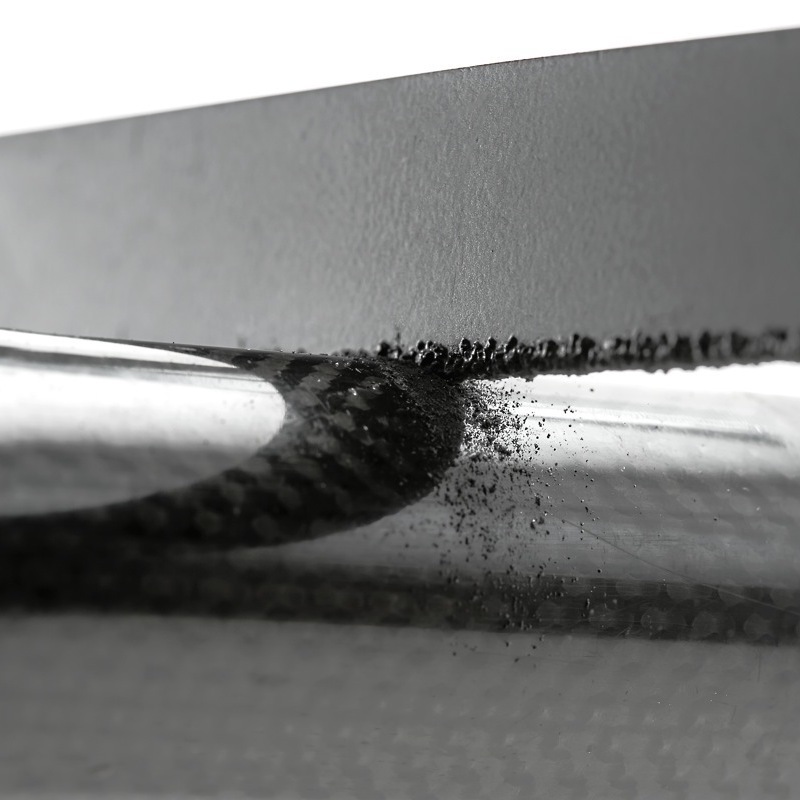 The 1.5mm cutting surface of the CarboCut blade passes clear in most cutting jigs. However, some of the popular miter blocks (such as the SG-6 Park Tool miter block) are a little to narrow. This isn't a problem as these narrow saw guides can be modified using spacer washers, as can be seen here on this page about Spacing a Cutting Jig for CarboCut. VeloNews: "The blade cuts on both push and pull stroke, providing more control and less vibration"
Great saw. Great deal! Very positive grip and excellent construction throughout. You can buy other premium hacksaws this one is better! And comes with a Tungston Carbideblade! So its a great deal! The blades are awesome. I have cut Carbon fiber bars and seatposts. As well as aluminium. Each cut is clean and sure. Still surprising (and reassuring) how much effort it takes to cut through a carbon fiber Handlebar though. I highly recommend this product. And if you are a pro-mechanic or just do your own wrenching like me; this is an excellent addition to your toolkit!